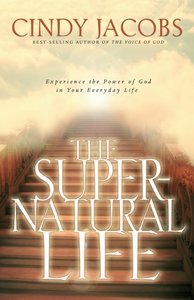 :Cindy Jacobs begins The Supernatural Life with a testimony of her first stirring encounter with the Holy Spirit. Her relationship with God was transformed, giving her the power of the supernatural in her life and the knowledge of how to release it. As in Acts 1:8, the Scriptures came alive to her more than ever before, and she found the capacity to witness boldly. With warmth, humor, and many revealing accounts, Jacobs shows that it takes the power of the Holy Spirit to do what God wants you to accomplish in your life. Join the bestselling author of Women of Destiny and discover step by step how to invite the Holy Spirit into your own life for remarkable change.